How many times have I heard that said about our work? How many times have I written that myself, when writing about AWF’s approach to conservation? I’m fully aware that some of our landscapes are the size of U.S. states, but understsanding that at an intellectual level is quite a bit different from actually experiencing it firsthand. During a short trip to AWF’s Maasai Steppe landscape in northern Tanzania this summer, I discovered that the Reducing Emissions from Deforestation and Forest Degradation (REDD+) project I was visiting in the Kondoa District in north–central Tanzania is actually a significant distance from our other work in the landscape. The bulk of AWF’s work in the Maasai Steppe centers around protecting a historic wildlife corridor between Lake Manyara and Tarangire National Parks. This is where one of AWF’s flagship conservation sites, Manyara Ranch Conservancy, is located. AWF has helped communities living around the conservancy and just outside the national parks establish wildlife management areas, which ensure the conservation of those lands while bringing in tourism and other income to residents. These parks and wildlife management areas, if not exactly close to AWF’s Maasai Steppe office in Arusha, are at least much closer to Arusha than Kondoa town is to Arusha. So why exactly are we also working in Kondoa, 270 km away from Arusha? 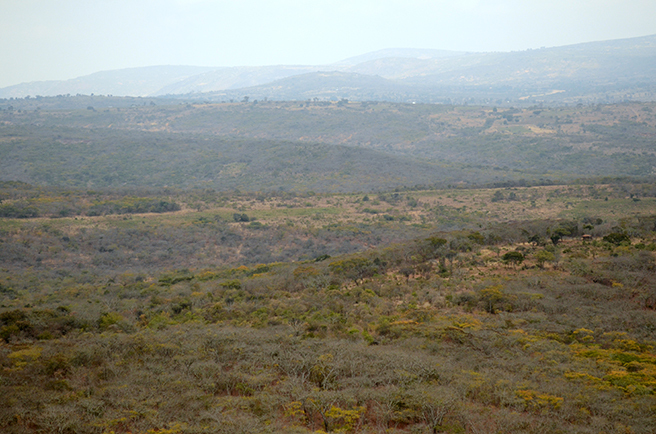 This is where that large-landscape perspective comes in: The Kolo Hills forests are located in Kondoa District. They are a critical water catchment area, forming the headwaters for the Tarangire River. The Tarangire River runs all the way from Kondoa to Tarangire National Park, providing water for countless communities downstream as well as wildlife in the park. To fully protect the critical wildlife corridor between Lake Manyara National Park to Tarangire National Park, then, we must also make sure the Kolo Hills forests don’t get cut down. With grants from the Royal Norwegian Embassy and the European Union, AWF is doing just that. We are working with 19 communities in the Kondoa District to select and employ forest scouts, train communities in livelihood projects ranging from nurseries to pottery collectives and, hopefully, get REDD+ validation on the Kolo Hills Forests to bring in carbon payments to the community that will provide further incentive to protect these forests—and, ultimately, to protect the entire landscape.